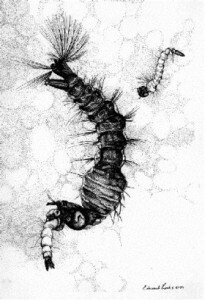 The obligate predator, Toxorhynchites rutilus is a serious problem for other treehole mosquitoes, including Ochlerotatus triseriatus, shown here. These larvae not only consume many prey during their development, but they go on killing binges just prior to pupating, during which they attack larvae wantonly without eating them. They overwinter as larvae, and their range is therefore restricted primarily to the southeastern United States. of this predator in action.